Cover Orange Players Pack 2 is another new point and click physics based game on notdoppler of which the levels are created by players. The game features a cute little helpless orange (though I wish it was the annoying orange) and other familiar fruits. 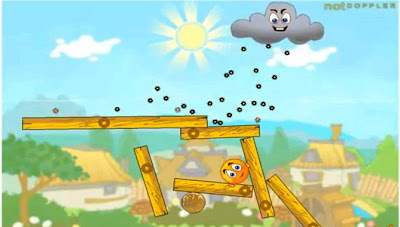 Your objective is to secure them using given objects from the pesky rain cloud who makes rain of black pellets. Strategically place objects to cover orange and make sure that they live to see the next level. COPP2 is pretty entertaining which offers 50 unique levels to solve. Also, I think the game will be available for the iphone soon. Oh, let's just hope. Anyways, as for the solution to all the levels of this game, here is Cover Orange Players Pack 2 walkthrough video guide.